Oden is one of common Japanese winter foods consisting of several ingredients stewed in a light, soy-flavoured dashi soup. Ingredients vary according to region and between each household. This is how you will find oden in the convenience store. How appetising does it look? 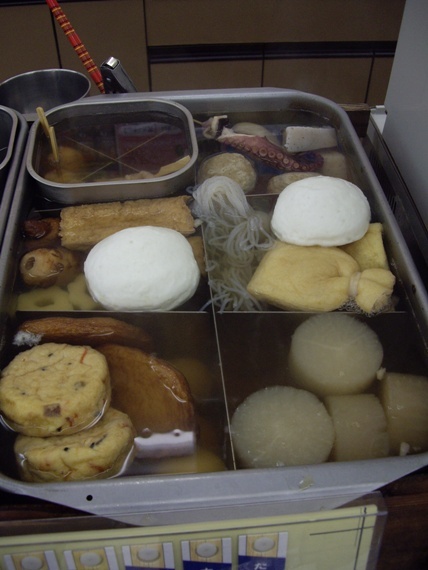 When you walk into a convenience store in winter, you are hit with the smell of oden. It is warm and comforting for some, and to others it is the smell of culture shock. Here are some of the most common ingredients. You can find these and many more at your local 7 – 11 (convenience store). At the convenience store choose what you want. I recommend you try the radish, egg, and ganmo. Karashi (hot mustard) will enhance your oden experience. Oden & Sake / Shochu….. They are the reason I like winter. yes! it helps get through the winter.